Today is National Grammar Day and word nerds across the country are celebrating. There are grammar haiku contests on Twitter, a litany of grammar-related memes on Facebook and it is likely that students will be subject to the whims of their over-eager English teachers on this most glorious grammar-focused day. But what is National Grammar Day exactly? And why should anyone care? William Safire, the famed American author, journalist and speechwriter for Richard Nixon and Spiro Agnew, said, “Only in grammar can you be more than perfect.” Considering his boss was far from perfect, figuratively speaking, I would say that this statement is true. 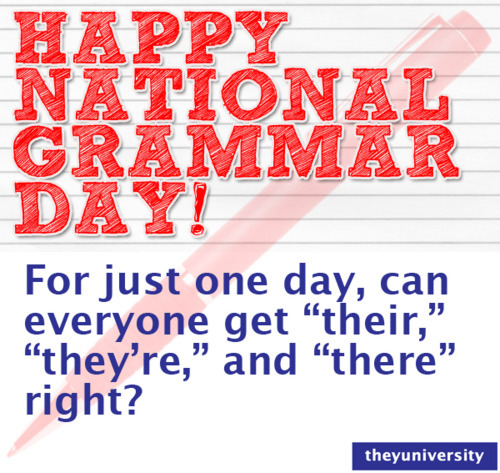 So, with that idea in mind, is National Grammar Day a holiday based on the goal of attaining grammatical perfection? The day itself was only established in 2008 by Martha Brockenbrough, who is the founder of the Society for the Promotion of Good Grammar. And here is a bit more background. National Grammar Day is celebrated on March 4th of the year in an effort to play on the idea of “March Forth” in the name of good grammar. Plus, “March Forth!” in and of itself is a complete sentence. Personally, I believe that there is a huge disconnect in the world of grammar. You have people who care about it deeply, like Brockenbrough, and then you have people who knowingly and proudly slaughter the rules of grammar all over the Internet. So what does this say exactly about our nation’s relationship with its language? While I agree with Turner’s words, I do believe that events like National Grammar Day have the ability to raise awareness about the importance of writing and language and their role in the preservation of our culture. Language and words should be celebrated. Moreover, good grammar can be fun and its proper delivery shouldn’t be something deserving of an eye roll and a yawn. So, in honor of National Grammar Day, I encourage everyone to “March Forth!” and engage in a bit of grammar vigilantism. Correct the Facebook status updates of your friends and instruct them on the difference between to, two and too, use the hashtag #GrammarDay unabashedly if you highlight errors in someone else’s tweet and unapologetically split infinitives—you owe it to your language. Consider it public service. And if anyone accuses you of being a Grammar Nazi explain to them that it’s just your way of celebrating a very important National Holiday. The team at Grammar Chic specializes in a variety of professional writing and editing services. For more information about how we can help you, visit www.grammarchic.net or call 803-831-7444. We also invite you to follow us on Twitter @GrammarChicInc for the latest in content writing tips and give a “like” to our Facebook page. Text GRAMMARCHIC to 22828 for a special offer. Great take on a truly traditional strategy. Now, how can other people beat that?